Home remedies can be good sometimes. If you’ve got a cold or your throat is feeling kind of lousy and you just don’t want to take anymore medicine, I find that a combination of hot water, organic Nature Nate’s honey, ground ginger, some tumeric, and two squeezed lemons really does the trick. I love it, actually. But sometimes, home remedies aren’t good at all. Sometimes they hurt more than they help. Like my grandmother used to do this weird thing with a cracked egg that’s supposed to help you if you have back pain. Don’t ask where the hell they learned to do this, it’s some old Albanian villagers technique. The person’s back would never get better. I think them being pissed off at their back-egg smell would just distract them from the fact that they had pain in the first place. 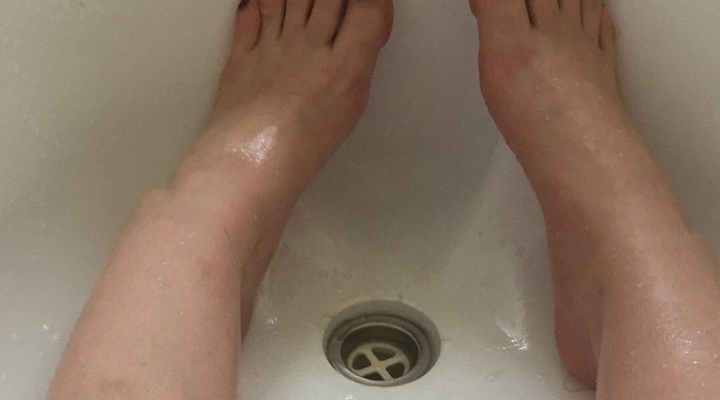 And if there’s someone who realized that home remedies don’t always work as advertised, it’s this woman who got stuck in a bathtub. She made a desperate post to Imgur after draining her tub and realizing there was no way she was making it out of the tub. Here is a funny and current story. She could’ve probably just turned the tub back on and wiped herself down, but being sick, having neck pain, and being all valiumed out isn’t probably a recipe for clear thinking.